The 2013 Girl Scouts of the USA Centennial Silver Dollar Coin is offered by the United States Mint as one of two commemorative coin programs in 2013. This silver dollar will be struck in both proof and uncirculated conditions and will feature a maximum mintage of 350,000 across all product options. Girl Scouts was originally established on March 12, 1912 by Juliette Gordon Low in Savannah, Georgia. Since that founding, the Girl Scouts of the USA has grown to include more than 3.1 million members today with over 10 million associated with the organization throughout the world. Surcharges of $10 per coin sold will be collected by the US Mint as directed by the authorizing legislation for the strikes - Girl Scouts USA Centennial Commemorative Coin Act (Public Law 111-86). According to the terms of the legislation, these collected funds are to be forwarded to the Girl Scouts of the United States of America with the understanding the money will be used for program development and delivery. 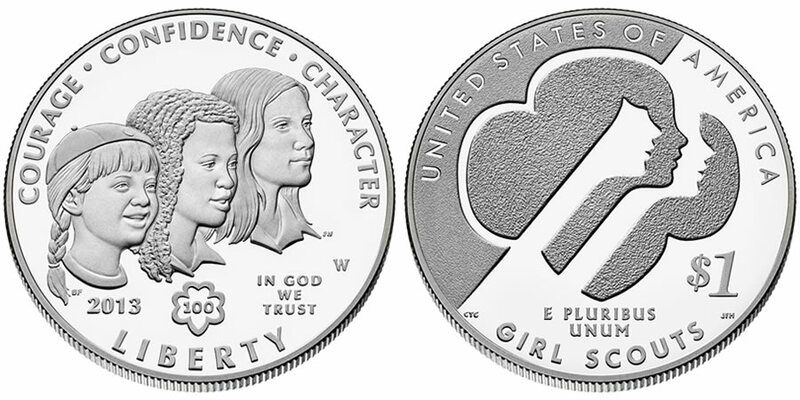 Three different girls are shown on the obverse of the Girl Scouts Silver Dollar emblematic of the different ages served and diversity of the Girl Scout program. The design was completed by United States Mint Artistic Infusion Program (AIP) Master Designer Barbara Fox with sculpting to be done by Mint Sculptor-Engraver Phebe Hemphill. Obverse inscriptions include COURAGE, CONFIDENCE, CHARACTER, 2013, LIBERTY and IN GOD WE TRUST. The reverse depicts the iconic Trefoil/profiles symbol of the Girl Scouts of the USA. It was designed by AIP Associate Designer Chris Costello and will be sculpted by Mint Sculptor-Engraver Joseph Menna. Reverse inscriptions include UNITED STATES OF AMERICA, E PLURIBUS UNUM, $1 and GIRL SCOUTS.